There are different ways to interpret corporate profits, and different ways to measure them, so it's possible that intelligent people can come to different conclusions about the state of profits and whether profits are being appropriately valued by the market. I'm of the belief that profits are quite strong, and the market is almost certainly not overestimating their value. 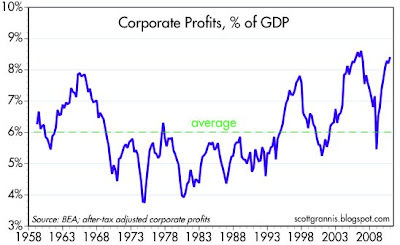 The top chart shows profits as a % of GDP, using after-tax adjusted corporate profits as calculated in the National Income and Product Accounts. This is a consistent measure of economic profits that goes back a long way. As you can see, profits have almost never been as strong as they are today, and profits have rebounded sharply (the V-est of V-shaped recoveries) in the past few years even though the recovery has been tepid. Given how strong profits have been, and how low interest rates are, you might think that equities would be at or near all-time highs, but you would be wrong. As a reminder, the S&P 500 index today is about the same as it was 12 years ago. 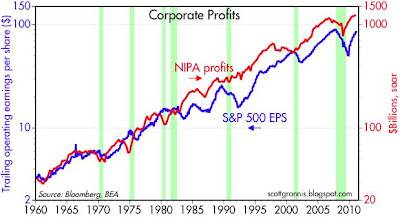 This next chart compares NIPA profits to accounting profits as reported by the S&P 500 companies. Over time, the two measures are well correlated, but I note that NIPA profits tend to lead accounting profits. NIPA profits are quarterly annualized numbers, whereas accounting profits are trailing 12-month totals, so they they have a built-in tendency to lead. Even taking that into account, NIPA profits tend to lead accounting profits, and NIPA profits are pointing to further gains for accounting profits in the year to come. 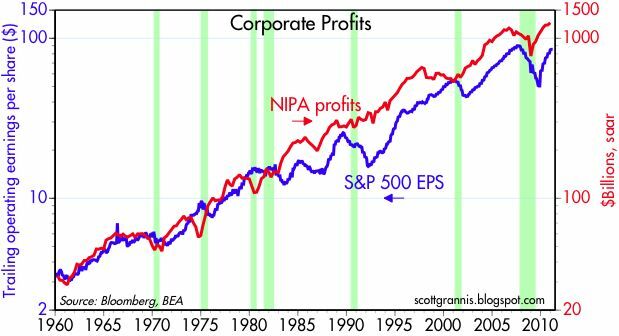 This third chart uses NIPA profits as a proxy for corporate earnings, and the S&P 500 index as a proxy for the value of corporate equity, to come up with a sort of economy-wide PE ratio. Here we see that the valuation of corporate equities is substantially below its long-term average, even though profits are very near their all-time high as a percent of sales (using GDP as a proxy for sales). One easy conclusion is that equities are definitely not expensive. I note also that the standard S&P 500 PE ratio, currently 15.5, is below its long-term average of 16.5. 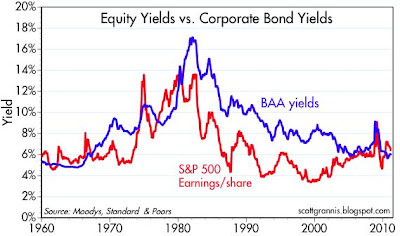 This last chart compares accounting earnings per share (i.e., equity yields) to BAA corporate bond yields. In a perfect world, earnings per share would be lower than bond yields, since equity owners are lower in the capital structure and bond owners get first claim to earnings; equity owners should be willing to accept a lower yield since they can benefit from higher equity prices and higher top-line growth. Instead, we see that earnings yields are higher than bond yields, a situation that has occurred fairly rarely in the past. I take this to mean that the equity market is leery, to say the least, about the potential of corporate profits to remain as strong as they are. It's as if the equity market believes—as suggested by the top chart—that profits as a % of GDP is mean-reverting, and thus the market is pricing in dismal profits growth for years to come. This is not an unreasonable position, but it is definitely not symptomatic of exuberance or over-valuation. Full disclosure: I am long equities of all sorts at the time of this writing. Boy, what an excellent review by Scott Grannis. I think there is an epic bull market ahead, in equities and property, and it will be global. The next 20 years will look a lot like 1980-2000, or 1987-2007. Global growth in free-market-ish nations will be strng. In other words, the Bush Era Financial Collapse is an aberration. I confess only one concern: It appears that a Long-Term Capital Management, or a Lehman Bros., or an AIG can tank the financial system if they go bad. The ability of speculators to leverage 100 to one or even more is worrisome. AIG promised to back bonds, and then didn't. In short, teams of guys behind computer screens, making bets with leveraged capital, can harm the real economy. Sounds crazy, but there you have it. The idea that there is a ticking time bomb out there, another Long-Term Capiatl Management, may be unsettling to investors. It may explain the cheap S&P 500. The full disclosure of your equity position is appreciated. Have you disclosed your bond position, if any? Perhaps I have missed it. I am long corporate (mostly high-yield) and emerging market bonds, and effectively short Treasuries. Thank you very much. I find it extraordinary that you share your personal investment positions. A cynic would say I'm just talking up my book. I like to learn what knowledgeable, thoughtful investors are actually doing. You always make excellent points in your discussions. I appreciate your work. Hard to believe that it is available real time and for free. Can you please comment on the q ratio, as popularized by Smithers, and regularly featured by Doug Short. 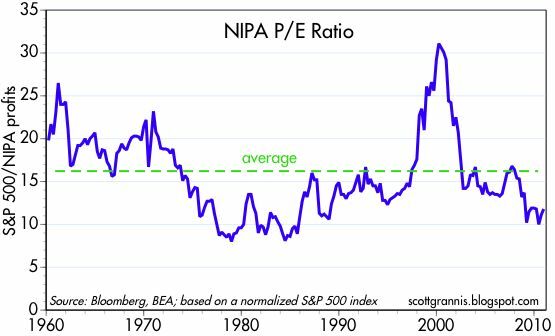 This measure - which shows the market to be meaningfully overvalued - has intuitive appeal as it is a quasi P/B measure, and over meaningful periods of time it agrees with a normalised earnings measure, and a real price measure, all of which currently suggest the market is overvalued. Scott -- any chance you could send me the S&P trailing operating earnings? I have reported EPS, but would like to use operating and recreate your P/E chart based on that. Based on the last graph, equities are undervalued, or bonds are overvalued. Correct? Not necessarily. For bond valuation, look to Treasury yields and credit spreads. Treasuries may be overvalued, but credit spreads are still attractive.